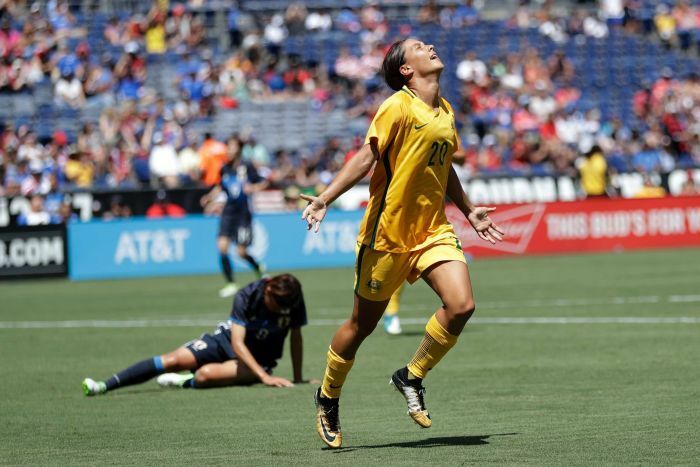 Australian football star Sam Kerr has continued her rise with a maiden international hat-trick in a 4-2 win over Japan in the Tournament Of Nations. After opening their tournament with a drought-breaking win over reigning world champions the United States, the Matildas backed it up by thumping the runners-up from the 2015 Women’s World Cup. Japan had started stronger in San Diego, when Mina Tanaka slotted from a corner in the sixth minute. It did not take long for the Aussies to respond, doing so via a close-range goal from Kerr’s prolific right foot. Her second came five minutes later after she picked the pocket of Riho Sakamoto outside the 18-yard box and gave Australia the lead with a 16th-minute strike. Then came the piece de resistance to cap off her first-half hat-trick. After a long clearing kick by the Matildas defence, the 23-year-old used her athleticism to nod a high-bouncing ball over Japanese defender Nana Ichise on the halfway line and chased through with time winding down in the first half. My conversation with @samkerr1 before the game today..
Sam: “yeh 3 haha!” No words, freak! She dribbled the rest of the way with Sakamoto on her hammer, before firing a shot into the feet of goalkeeper Sakiko Ikeda. But Kerr stayed alert and gathered the rebound before calmly nailing her second shot and running off into a slick somersault/back flip celebration that has become something of a trademark for the West Australian, who has made a name for herself with Sky Blue FC in US National Women’s Soccer League. Emily van Egmond added the Matildas’ fourth in the 62nd minute before substitute Yuka Momiki ensured Japan ended the game the same way they started, with a 93rd-minute goal. Next up for the Matildas is a showdown with world number eight Brazil in Los Angeles on Friday. Australia — currently seventh in the world on the FIFA rankings — is set for a big jump, especially if it can complete a clean sweep of the tournament. A free service to promote women's soccer in WA at grass roots level. Contact Penny on 0408 921 832 or socceron@womensoccer.com.au at any time for up-to-date news and information. Refer to Club Noticeboard for player, team and club news. You can now hear THREE (yes, 3) hours of The World Football Programme every Saturday throughout the year on 107.9FM thanks to sponsors of the programme and Radio Fremantle. Penny is looking for historical photos and information about your club and women's soccer in WA up to 2005, for a second book about the history of women's soccer in WA.